I'm moving out of my parents' house in about a week. My mom, however, has asked me every day since I moved in when I'm moving out, so there's that. I've lived in this room nearly my entire life and since graduating college, I've been here a year. 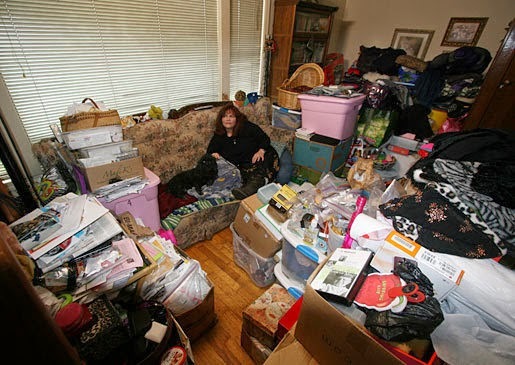 I'll go ahead and get this out of the way: I'm a hoarder. me chillin in my room. me all day every day. If you put something somewhere, that's where it's going to stay. I have no eye for decoration, no strength for rearranging, and like I said, I'm lazy. 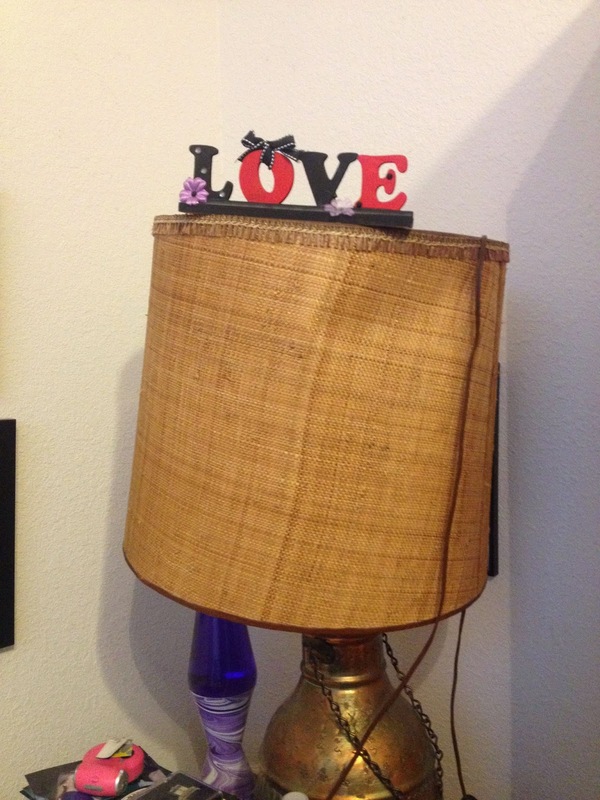 Example: My mom saw this Love sign all by its lonesome and thought it would be funny/creative/nice to put it on top of a lamp I stole from my grandmother. And there it sits today, Nov. 20, 2014. 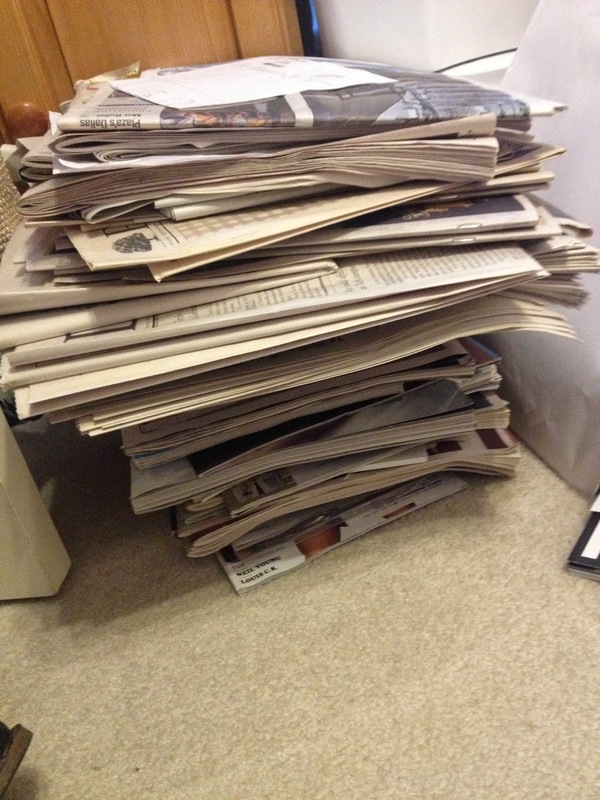 I'm also a severely sad magazine and newspaper hoarder. If I have even the smallest byline in a newspaper, you better believe I have a copy of it. And if I have a front page story? I have five copies of that newspaper. I have this insane fear that someday a potential editor is going to want actual newspaper clippings of my work, so I keep everything. Lol k.
my bylines. tell me i'm famous. And I keep magazines because my grandmother did and I think it's the coolest thing in the world. 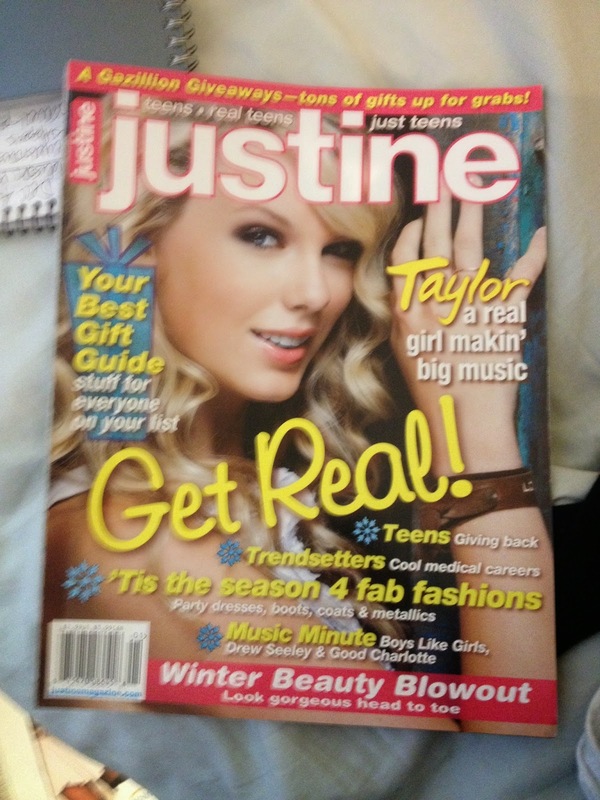 I don't know why, but I can't let go of a Justice Magazine with Taylor Swift on the cover when she was kind of a nobody. It's one thing to read the article online, but it's a completely different thing to see it in actual real-life print in my hands. And my grandkids are going to want to see this one day, right???? Will I have grandkids???? Is anyone going to marry me???? I don't update pictures in picture frames, so they're all still high school friends who I don't speak to anymore. I don't get rid of purses, so my very first Dooney and Burke is still proudly hanging in my closet (colored stars on a black background, what up 2006). And even though I haven't turned on my lava lamp since 2004, there it is, sitting in the corner of my dresser, in all its purple and lava-y glory. It's tragic. This is all so tragic. Behind my 20-year-old, 13-inch TV (I refuse all suggestions of updating my TV because it's the only man who's stuck by me. Yes, I just called my TV a man. 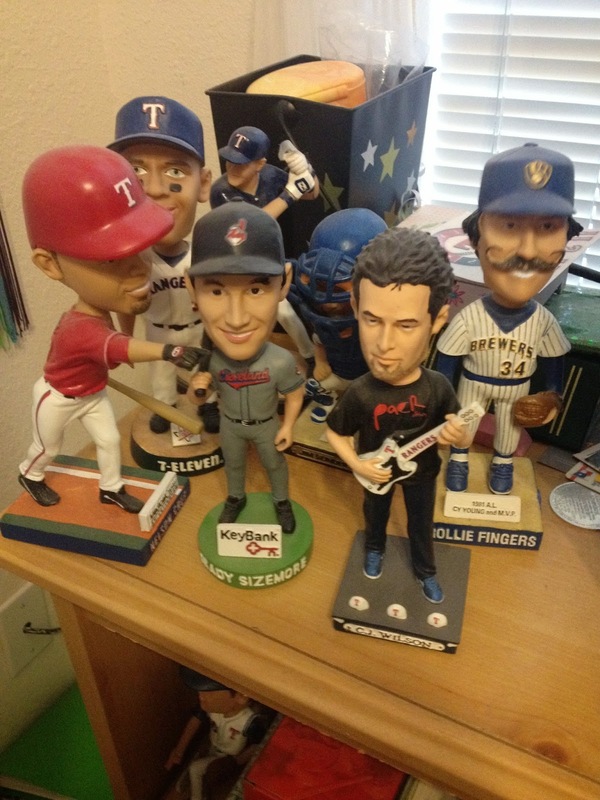 Bye), I have about a dozen bobbleheads because I'm a boy. what up, cj wilson, rollie fingers, and other guys on roids. Somewhere is Britney Spears's very first EP. The one with ...Baby One More Time and Autumn Goodbye. AUTUMN GOODBYE. If you have never heard that song, stop what you're doing and enjoy. It's a Brit classic. Hanging on my walls... oh, my god. That's another story. First I have a letter Hannah Roden wrote me before I graduated high school. 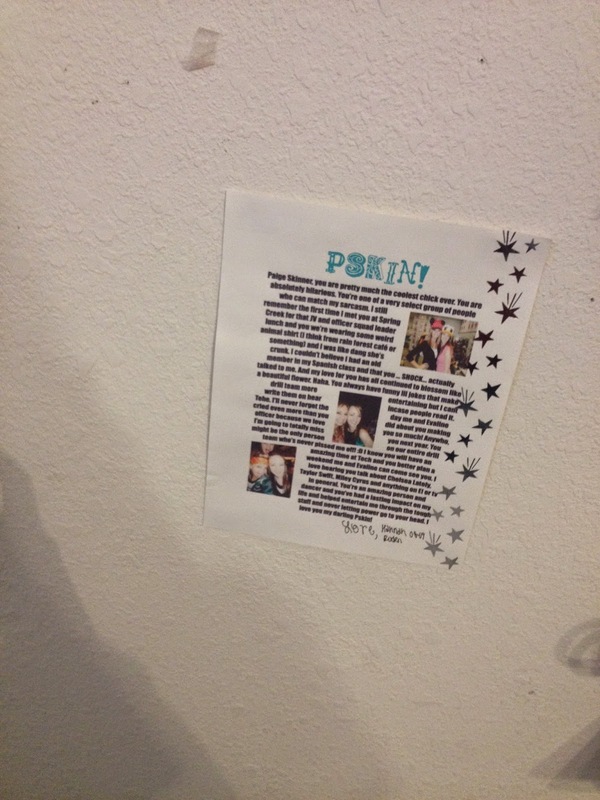 I also hung Stacey Donelan's letter, but it fell one night and I haven't seen it since. do you see the tape that once hung stacey's letter? sorry. 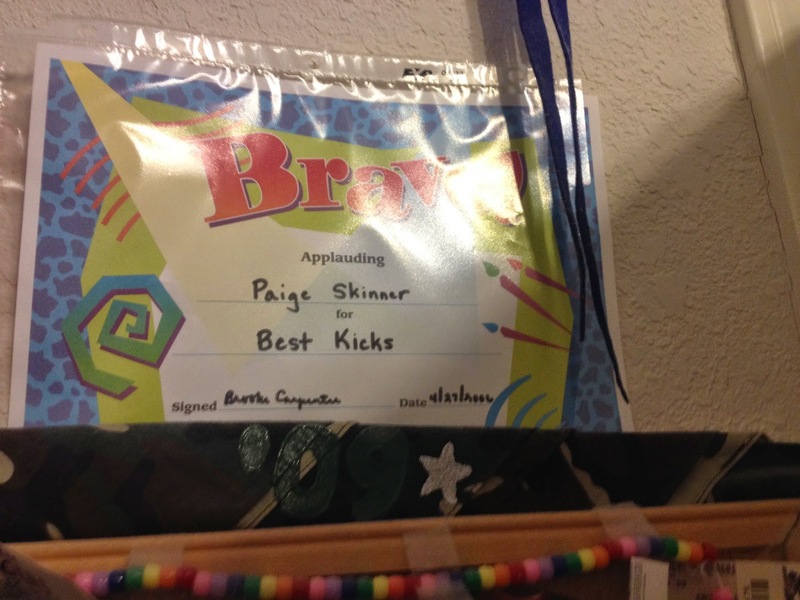 Above my bulletin board, I have a certificate proclaiming me as the Best Kicker of my ninth grade drill team. It's one of my prouder moments. I can't even touch my toes now, but good god, I was great in ninth grade. 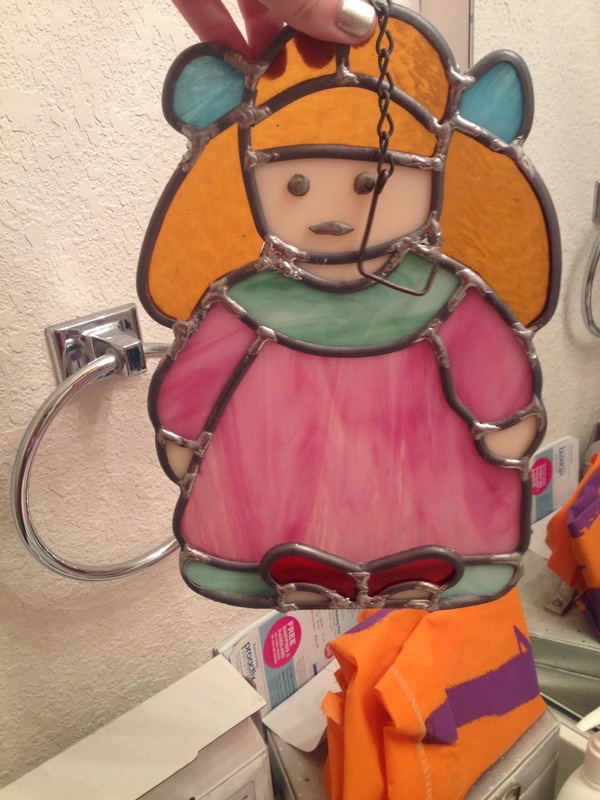 I also used to have this creepy little doll, stainedglass thing hanging in my window until one day it wasn't there anymore. It was in my bathroom instead. I don't know, it's kind of creepy, especially considering I don't remember taking it down. But like wtf is this. I also have a nightstand thing that's drawers are filled with journals because I've kept a journal since I was 6 years old. I also have this fear that I'm going to die famous and y'all are going to make a Lifetime movie about my life and it's going to be a hot mess like the Brittany Murphy one. There's no room for that. I have four drawers filled with journals and diaries and I think that's the same thing, but a diary makes me sound like a 14-year-old girl who likes horses and her mom, so don't get my Lifetime movie wrong. I either have to pack all this stuff or throw it away. Prayers appreciated.